Kids 2 and under get in for free. Q: What are the event hours of NissFest? Q: Any general questions about NissFest or NissFest related items? Q: Are tickets per person or per car? Q: I pre-registered for the AutoX/Track Day/Have Prepurchased Track tickets do I still need to pay the $10 Gate Fee? A: Yes, everyone who enters for the track & Auto Cross event is charged by the track organizer (Speed Ventures). Car show registrants are exempt from this fee. Q: Can I bring my EVO/350Z/Mazdaspeed3/Miata/Other? A: Yes/Yes/Yes/Yes-all cars & vehicles are welcome. Q: Will food be available? A: Yes, we will have great food trucks, but plan ahead for cash in hand. Q: Can I bring a grill? A: No, unfortunately, BBQ'ing is not permitted in the NissFest parking lot. Q: Will alcohol be available? A: No, no alcohol will be available at NissFest 2018. Q: Do I get a goody bag? A: Yes, if you're one of the first 150 people to enter you get a goody bag. Q: How does the door prize raffle work? A: Awesomely. Read about it here. A: Sorry no pets are allowed at AAA Speedway. A: No refunds on tickets. NissFest happens rain or shine. Q: Can I leave NissFest and come back in? A: Yes, you will be issued a wristband for the event which will allow you to leave and enter all day long. Q: Can I bring stuff to sell? A: No, only paying vendors can sell at NissFest. Anyone vending or marketing products or service at NissFest w/o being an approved vendor will be asked to leave. Please contact Tony@nissfest about becoming an authorized vendor. Q: Can I bring my kids, parents, grandparents? Kids 2 and under get in for free. A: YES!!! 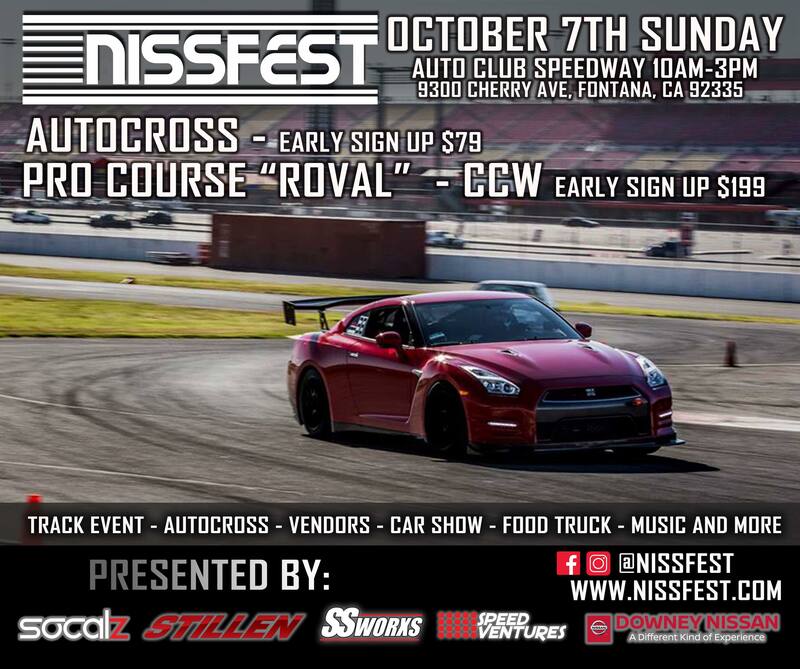 NissFest is, by design, a fun for the whole family event. A: Yes! But it is CASH ONLY at the gate. Please visit one beforehand if you plan on buying your ticket upon arrival. We will hold your car and treat it Ferris Bueller style while you go to the ATM inside AAA Speedway to get your admission money. Q: Will there be tickets for sale? A: Yes, $15.00 per person only for general admission (no special packages) and again, CASH ONLY!! They will be available at the ticket booth inside. A: Nothing official through NissFest for attendees. 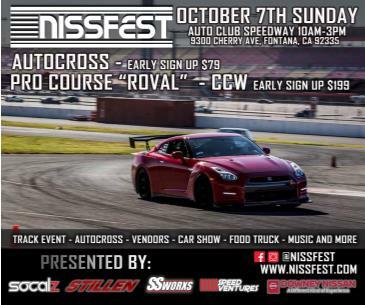 A: Yes, if you are trailering a car to NissFest there will be a place to drop your trailer away from the vendor, cars show, rally expose areas. If you are trailering please let us know ahead of the event so we can give you special instructions.